I extend to you, my fellow citizens best wishes for a year filled with happiness and success. I want to assure you that we can look to the year ahead as a nation, and a community, with confidence. We have been through very tough times, and there are challenges that remain as we enter 2018. Reduced world commodity prices, and the impact of drought, are among several factors that have placed pressure on our economy. In Government, we understand and appreciate how tough things have been for families and communities right across Papua New Guinea. A difficult economic environment impacts directly on our richest resource of all, our people. This makes me more determined than ever to deliver the leadership you expect and deserve to guide our nation, and all our communities, into the better times I know are ahead of us. Now, as we enter 2018, our economy has turned a corner, and we see improvements. Commodity prices are improving and new investment in the resources sector is stimulating economic activity and creating jobs. Investors in the global economy have confidence in our country. Even during recent tough times we maintained positive economic growth, and Papua New Guinea is seen as very politically stable. That is what our businesses, and our investors, are all looking for in the years ahead. The national elections affirmed the underlying strength of our parliamentary democracy. At the elections, the people returned our Government with a secure majority so that we can continue to advance and change our Nation for the better. A strong and stable government, supported by an overwhelming majority in the National Parliament, is the foundation that will guide us through the challenges and opportunities of the coming five years. We are building a more prosperous nation in which the benefits of growth and development are more equally shared by all. Our Government will continue to improve the key policies that directly benefit the people of Papua New Guinea. Firstly, our free education policy has been delivered, and the quality of education will be improved. We will train and employ more teachers, build more school buildings and continue to increase resources for teaching materials and technologies. Secondly, we will build on our basic free healthcare commitment by re-building hospitals and health centres. We will strengthen the work of church hospitals and other health services, and the vital work of agencies such as the YWAM medical ships program. Thirdly, we will continue to re-build and expand our critical infrastructure, such as roads, bridges, airports and ports. The Highlands Highway remains a high priority and this vital road will be rebuilt and delivered to an international standard. And fourthly, we are successfully decentralising decision making to local communities in district administrations and local level government. More and more decisions are being made at the levels of government that are closest to the people, and this is particularly important in remote and rural areas. Taken together, these four policy areas are very important areas or public interest that directly benefit the people of our nation and the communities in which we live. In the years ahead, there is no doubt that we will face new challenges, and we will take these head-on, just as we have in the past six years of Government. The national budget for 2018 has been prepared with great care. We will not indulge in spending we cannot afford, and we will ensure as much of the burden as is possible is carried by the Government and its agencies, not by businesses and communities. The fundamentals of our economy are strong, we have sound GDP growth and increasing resources available to invest in key areas. We all know that our all-important agricultural sector requires significant Government and private sector investment. By working smarter, we can meet our domestic food needs, and generate vital export income for our nation. Rebuilding and expanding the farm and agricultural sector is a key priority in the year ahead. We will assist producers to improve the quality of their crops, and we will improve the infrastructure in rural communities across the nation. As we advance our commitments we made at the formation of Government in Alotau, we will deliver on policies that will expand housing and home ownership in villages, small towns and urban communities. Our Government will improve the delivery of essential community services including electricity, water and Internet connectivity. We will also do even more to expand our small to medium size enterprises sector. 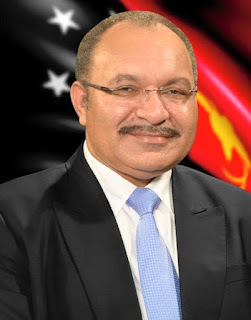 We need more businesses that are owned and managed by our own people, that are employing young Papua New Guineans and helping communities to grow and prosper. These policy commitments all provide their own challenges, but with a stable government, sound fiscal policies, and your support, we turn challenge into opportunity. Finally, the year ahead will improve perceptions of our country as Chair of the Asia-Pacific Economic Co-operation (APEC) Summit. This is the most important international event in our history, and it will bring together the Leaders and senior business executives of APEC’s other 20 Member Economies that account for more than half of total global trade. The way the world looks at Papua New Guinea will change for the better, and this will stimulate new investment and business, and create more jobs for our people. In sectors such as agriculture, fisheries, tourism, transportation, and mining, and in enhancing the role of women in our economy and helping SMEs, APEC will make a very positive contribution to strengthening our capacity. I know you will all join with our Government in making this great opportunity of hosting APEC an outstanding success. I wish you and your family, and people around Papua New Guinea, the very best for a happy, safe and successful 2018. Happy New Year Papua New Guinea.